Even before I got my hands on the Boon Frog Pod, I was in love with the look, who doesn't love tree frogs anyways? Though as much as I loved the design I was a little hesitant, its large, which in all is a great thing.. there is TONS of room for storage which I've quickly found is required as some of those baby bath toys are rather large. 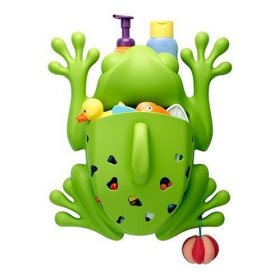 As well as toy storage you can comfortably fit two or three bath products on the internal shelf under the frog's face. I honestly have no desire to drill holes in my tile and I personally have no problems with stick ons I was skeptical with a bath product that would stay in a humid bathroom. So, I went with the suction cup method and held my breath. Well that was two months ago and the frog pod has been holding strong, full of toys, and loaded with bath products. Can I just tell you how pleased I am?!?! My other concern was the size of the Frog Pod, at 19" x 16 1/2" x 7" its certainly not small but I've found the hard way that you need every single ounce of that storage space even with just a few bath toys. Honestly, I was concerned it would make my bath feel smaller from the size of the frog pod but the truth is, for the first time since Connor was born, my bath tub has never been more organized!!! Connor may be lovin his new bath toys and big boy bath routine (no more baby bathtub woo hoo!) but I'm really diggin his Frog Pod as it makes bath time clean up a breeze and I no longer step on toys when I get in the shower. Now If I could just get his toys in his room as organized that truly would be something! The Boon Frog Pod is available in their online store as well as on Amazon! i love your blog! this is exactly the kind of site i've been looking for...hard to find baby stuff you can't go without! i live in Manila and i still have to travel abroad to get my darling angel, kristen the good stuff!